There’s no shortage of high speed futuristic racing games these days, so it takes something pretty special to stand out. Some say gravity is pretty special. Some say anti-gravity is also pretty special. 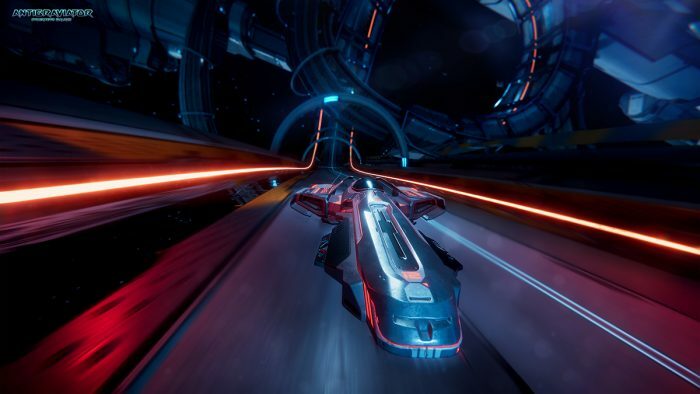 Cybernetic Walrus’s Antigraviator fits firmly in the hyperracer genre, focusing on incredible speed and futuristic tracks. Where it tries to differentiate itself is in its higher focus on leaving said tracks at said high speed. What stands out immediately from my recent hands-on at PAX is the buttery smooth 60fps moving at mach infinity around highly detailed tracks. The game never skips a beat or stutters, performing flawlessly, even with multiple cars on screen. 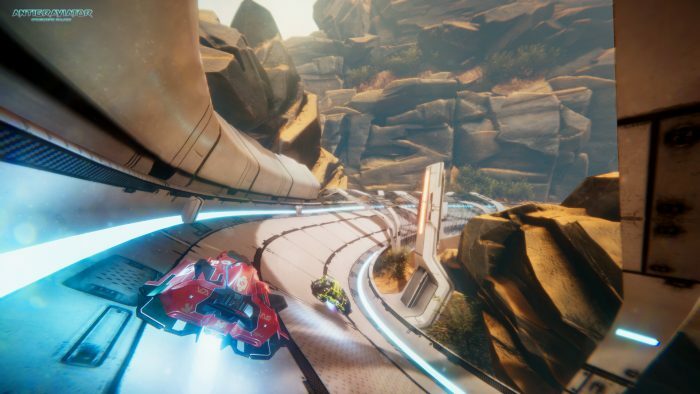 Keeping the visual fidelity consistent in a game with so much motion is a requirement for playability, but it also lets us see the really cool track design in all of its glory. Though their lanes seem narrow by design, the courses themselves have a lot of dimension, with loops and jumps and what even feels some sections with trick maneuvers. Some areas have us upside down, while others snake us left and right as we get thrown around corners. It’s important to memorize those track layouts, too, as the design hazards aren’t the only thing that can slow us down. Even when playing against PC opponents, weapons and traps become a factor in where we place in the race. Traps can be set for the other racers behind us, or we can alter the terrain (yay to avalanches!) to affect the race in more major ways. We can fire away at those ahead of us, but this is a little tricky, since aiming takes a lot (a LOT) of practice. I never hit other cars accurately, so I just boost past them. In fact, the game has a little of the karting genre in it, with more action than a standard car-based racer. While some in-game customizability is nice, the visuals are stunning and the speed is blazing, what’s going to be most important in the long run is how active the online community will be. This is a standard necessity for racing games, especially with the genre not going away any time soon. The developers have been actively engaged with their fans, so I’ll be curious to see if and how it evolves over time post launch. Antigraviator releases this year for PC, Xbox One and PS4.